They have been reproduced exactly as they have been printed and distributed for over 35 years by Mr. and Mrs T. Moreton of Neston, England. You are free to download, print and distribute them as you wish but it shall be remembered that the original copyright for the various documents shall remain the property of Mr. And Mrs Moreton. No changes, additions or amendments shall be made to these documents without the prior written consent of them. Extract from the booklet Teresa Helena Higginson, which is available as a download on this site. “Teresa was the 3rd child of Frances Higginson, a Catholic from Preston, Lancashire, England and Mary Bowness from Cumbria, converted by a Jesuit Priest to Catholicism, who was her guide on a trip to Rome. The couple met in Ireland and were married at Loughlyn, Roscommon in October 1841. Returning to England they settled in Gainsborough, Lincolnshire. While expecting Teresa, her mother went on a pilgrimage to St. Winefride’s Well in Hollywell, North Wales. Teresa was born in Holywell on 27th of May 1844 and was baptised Teresa after Teresa of Avila and after Helena who founded the True Cross. The family grew to 5 girls and 3 boys. Living in a small Catholic community, they built a chapel in their house for Priests to say Mass. Many famous visitors included Bishop Roskell, Dominic Barbari CP who baptised Teresa’s sister Louise and Ignatius Spencer CP. Teresa had a lively dominant personality and strength of will. Once she made up her mind she would do it come what may. Aged 3, experiencing the mystery of the Blessed Trinity and feeling surrounded by an overwhelming power and majesty she gave herself to God in imitation of Our Lady giving herself to God as a child. Also at a young age, after ignoring her Mother calling for her, she became so upset that she told a visiting Priest Fr. Smith. In March 1854, aged 10, Teresa and her sisters were sent to be educated by the Nuns at the Convent of Mercy Nottingham. She was a high-spirited tomboy but had frail health. After falling from a tree she was sent home to recuperate and returned a year later. Still in poor health she spent much time in the Covent’s garden with the wheelchair bound Sister M Aloysius Perry. Realising her strong willpower she started to control it by vowing to mortify the senses. To advance in holiness she knelt for hours before the Blessed Sacrament, she even got up in the night to say the rosary. When another child was told off in the class Teresa offered up her own sufferings in reparation for the sins of others. This infuriated The Devil who would shake the convent. Aged 12 Teresa made her 1st Holy Communion on 12th April 1857 and was confirmed Agnes on 17th May 1857. In 1865 Teresa left the convent aged 21. The family went to live in St. Helens, Lancashire. Her father became bankrupt so they moved to Liverpool. Teresa went round shops and convents to obtain needlework orders. Next, the family moved to Egremont but she stayed at home because of ill health. In 1871 an epidemic of smallpox occurred. St. Alexander’s school in Bootle, Lancashire was short of teachers so Fr. Powell wrote to Sister Mary Phillips, head of Notre dame teacher training college, Mount Pleasant, Liverpool asking for a teacher. She had none but recommended Teresa, the sister of one of her the students. Teresa travelled to The Cross and Passion monastery in Little Sutton, St. Helens to see Fr. Ignatius Spencer. He told her that God had special designs on her, that she had no vocation as a Nun but would live in a convent for a while. She did have a vocation to teach. Without studying Teresa managed to pass the teaching exam and after spending a year teaching in a village school in Orrell, Lancashire she was passed by the Government inspectors. She took up a teaching post at St. Mary’s Wigan, Lancashire in 1872 and stayed for 3years. During that time as Teresa lived with her fellow teachers, Miss Susan Ryland and the Miss Catterall sisters, they witnessed strange goings on in the house. Also in the various places Teresa lived in later, people including priests were able to independently testify as to supernatural occurrences. In Wigan, The Devil was heard throwing her out of bed and made various noises, which frightened the others. The women came to realise her strange fits were states of ecstasy – ‘darts of love’ in which her body would go rigid and nobody could move her or her body became soft and light. She would come out of the ecstasy by command of the parish priest. Minor miracles were noted, such as the sudden appearance of a bar of soap on the table. Teresa also said to Susan Ryland that Our Lady had appeared to her. They noticed her rigorous fasts, living on the Eucharist alone, taking no food for up to 3 days. Teresa suffered much, especially in lent. Her fellow teachers realised Teresa was privileged with the Stigmata as they first noticed bleeding from her hands and feet on Good Friday 1874, the Stigmata appeared at various times over the years but disappeared altogether on her deathbed. The trials and sufferings were a more intense purification of Teresa’s soul, which lead to the Spiritual Betrothal on the Feast of the Sacred Heart in 1874. Despite all the sufferings, Teresa was witty humorous and alert, entering whole-heartedly into everything she took in hand. She had no interest in clothes, wearing her sister’s cast-offs and spending money on books and Holy objects for others. She was never cross or out of humour. Teresa introduced religious topics without boring people. She would often know when people were coming and her brother told of her guardian angel carrying a heavy tray upstairs while she remained at the bottom. Her influence on children was very great and they quickly fell under the charm of her personality. In December 1875 Teresa returned home, taking a job with Fr. Lynch at Seacombe, Wirral then for a short time another at St. Albans at Liscard also in Wirral. Whilst there, and before leaving for a job with a Jesuit mission in Sabden Teresa had a vision of her father’s death in a St. Helens street, he died on October 13th 1875 in a St. Helens street. During 1877 her health broke and she returned to her family by now living in Neston, Cheshire were they had charge of the school. Fr. Powell became her Spiritual Director and Teresa made a solemn vow of obedience to hi. He asked her to write down the experiences of her soul. It is from these letters that we learn of the events in her life, the supernatural happenings, her visions and many other spiritual matters. Teresa was not happy in Neston, as she frequently was unable to get frequent communion. Fr. Powell got her a post at St. Alexander’s school, Bootle, Lancashire where Teresa remained from 20th September 1879 to 1887, almost 8 years. Although the 1st revelation concerning the Wisdom of Christ took place in Neston, most happened whilst Teresa was in Bootle. Teresa first lodged with Mrs. Carter then moved to Mrs. Nicholson who had a shop next door to the church. When she died Teresa went to live with her fellow teachers, the Catterall sisters and Elizabeth Roberts. They and the landlady were to testify to Teresa’s ecstasies, the stigmata and her tremendous self-control. The Devil’s banging and dragging noises frightened her fellow lodgers and he even impersonated Teresa’s own voice to deceive people thus fuelling rumours and gossip. This unrest caused Bishop O’Reilly to ask other Bishops and Priests for their opinion. After an unfavourable report by Fr. Hall OSB the Bishop told Teresa to stop writing about the devotion. Her Spiritual Director was relocated and replaced with Fr. Snow who agreed to take on the task and began to study the mystical life. Teresa’s mother whilst Teresa was at home in 1883 and after returning to Bootle Teresa was refused Holy Communion by a new parish priest who did not believe her. Because of the rumours and gossip Teresa was unable to get a job in Liverpool but obtained a post at Eccleshall in 1886 – she was forced to endure a 5-mile walk to attend mass. Several other short-term positions followed. In July 1887, Teresa went to stay with a friend, Elizabeth Dawson in Clitheroe remaining for 3 months. Her sufferings increased greatly until on the 24th October 1887 she experienced the Mystical Marriage. Teresa felt unable to return to her former position but felt instead drawn to go to Scotland, with Fr. Snow’s help she arrived at St. Catherine’s Convent, Edinburgh where she remained for 12 years with the Nuns. Whilst there, she continued the same life of prayer, suffering but with an absolute peace. After the Mystical Marriage Teresa felt power from within. She lacked the same thirst to suffer, but felt it better to rest so as to work. Teresa cooked for the Nuns and taught for a while at Fr. Forbes Leith SJ’s school in Selkirk, foretelling that some of the children would die in a war of submarines and aeroplanes. She appeared to know of the deaths of people at a distance, bilocating to the deathbed of Bishop Roskell’s. In time a shrine to the Sacred Head was built in the Edinburgh Convent. Teresa returned home in July 1899 when her sister Fanny took ill. After her sister recovered Teresa stayed with Annie Garrett and her brother who had a shop in Mount Pleasant, Liverpool. Teresa was happy here and able to attend 3 daily masses, it is also reported that Teresa foretold the building of the City’s Catholic cathedral. During 1900, Teresa went with a Mrs. Fleck on a pilgrimage travelling around Italy and meeting Pope Piux X. The next 2 years were spent in nursing a number of the sick and dying including Fr. Powell before returning to Neston once more in 1902. Teresa was called to Devon in November 1903 by Fr. Dowsett, the chaplain at Chudleigh, where they needed a teacher. She arrived and took up residence in the small house next to the school in January 1904. The house was cold and damp and at Easter, Teresa caught Bronchitis after returning from a visit to Neston. Despite the hardships Teresa remained in her new position and the children grew to love her. On the 14th December 1904 while preparing to return to Neston for Christmas, Teresa had a stroke. A nurse, Miss Casey was engaged to care for Teresa and the nurses sister Mrs. Statt would often sit and talk with Teresa promising that if she died she would give Teresa her Franciscan tertiary habit to be buried in as Teresa had given all 3 of hers away. Teresa was given the last sacraments but seemed for a while to get better before again relapsing. Finally, on February 15th 1905, Teresa died and her sisters came to take her body back home to Neston. Snow lay on the ground as Fr. Thompson buried her with her mother in the churchyard of St. Winefride, Neston. 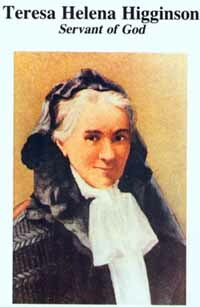 Canon Snow, her Spiritual Director for over 20 years collected all her letters and many others eye witness accounts. Canon Snow was convinced that Teresa was not only a saint but one of the greatest saints raised up. He pointed out that Teresa was essentially a contemplative saint rather than an active one. She never did any outwardly great works, she was always weak and feeble and suffered without ceasing. Teresa’s cause for canonisation went to Rome in 1937 and it reached the stage of her being declared ‘Servant of God’. The church of St. Alexander, where she was told would become a place of pilgrimage was firebombed in May 1941. Her grave in Neston became and remains a place of pilgrimage for many.